A former TV news anchor whose girlfriend died in an on-air shooting two years ago unseated a Republican incumbent in Virginia’s House of Delegates on Tuesday. Democrat Chris Hurstdefeated three-term incumbent Del. Joseph Yost (R) in Virginia’s 12th district by a 54 to 46 percent margin, with 97 percent of precincts reporting. Hurst, 30, was the evening news anchor at regional channel WDBJ Channel 7 in August 2015 when a disgruntled ex-employee of the station shot and killed Allison Parker, Hurst’s colleague and girlfriend, during a live news appearance. The shooter also killed the cameraman who was with her. Hurst moved from Roanoke to Blacksburg in January and announced his decision to run for office shortly thereafter. “I owe the residents of southwest Virginia a debt of gratitude that I don’t think I’ll ever be able to repay. But this seems like something worthy of what they did for me,” Hurst told HuffPost in alengthy interviewin July. 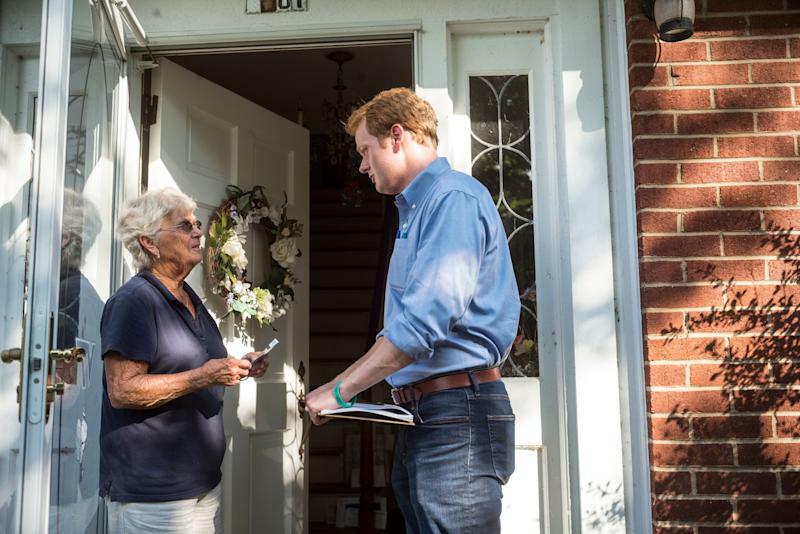 Democrat Chris Hurst, right, canvasses in Blacksburg, Virginia, in July. Hurst unseated Republican Joseph Yost on Tuesday. Democrats were expected to flip several seats in Northern Virginia suburbs. But Hurst’s Southwest Virginia district, which stretches from Blacksburg, home of Virginia Tech, to the rural hollers of Giles County along the West Virginia border, was a tougher get. The 12th district’s political breakdown makes it a near-perfect toss-up for Democrats. It was one of 17 GOP-held seats where voters opted for Hillary Clinton over Donald Trump in 2016, but only by a2-point margin, leaving little room for error. Hurst’s solid defeat of Yost, a well-liked 31-year-old son of Giles County, reflects the Democratic Party’s strong performance on Tuesday. Hurst also had a major advantage thanks to his name recognition and the enduring popularity of local TV news personalities. As an award-winning former investigative reporter, Hurst campaigned on taking the same intrepid spirit that informed his work as a journalist to the state House on behalf of his constituents. Phyllis Niece, 77, could not remember the last time she had voted in any election, but told HuffPost in July that she planned to cast a ballot for Hurst. Although Hurst was open about his support for tougher gun safety measures like closing background check loopholes, he was clear that it was not the main focus of his campaign. “If I was someone who was solely focused on one issue, then I would have been an activist on that one issue,” Hurst told HuffPost. Instead, Hurst ran on using Affordable Care Act funds to expand Medicaid, protecting reproductive rights and beefing up funding for rural schools. His base of support was in Democratic-leaning Blacksburg, but he frequently ventured to deep-red Giles County, drawing a crowd of nearly 100 people at a meet-and-greet in Narrows, Virginia, on a Friday evening in July. Hurst bucked Virginia’s top Democrats, including Gov. Terry McAuliffe and Governor-elect Ralph Northam, in opposing the construction of the Mountain Valley pipeline due to run through his district.